Size (inches): 2.17" X 2.17" X 4.33"
This formulation works synergistically to support and stimulate the repair of joint tissue. 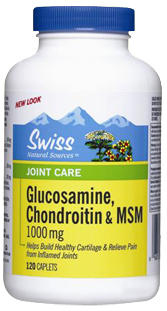 Glucosamine Sulfate, MSM and Chondroitin Sulfate are all components found in joint tissue. Glucosamine is a component of cartilage. Supplementation with Glucosamine Sulfate stimulates the body cells to manufacture its own glucosamine which will maintain and repair joint tissue. Chondroitin Sulfates (CS) are common mucopolysaccharides which are bound to collagen, where it works synergistically to keep tendons and ligaments strong and resilient. MSM (Methylsulfonylmethane) has high organic sulfur content (34% by weight) and will help supplement the body sulfur requirements. Sulfur is one of the body's most abundant minerals, supplying the building blocks for amino acids, vitamins, hormones and "physical" structures including collagen, skin and nails. My father is 70 years old. He has gotten the knee arthritis, articular cartilage, and bend his back with pain for 5 years. Would you please tell me how long and how many bottles of Glucosamine, MSM & Chondroitin sulfate he should use to be quite recovered. It is impossible to give an exact timeframe as to when and if your father will undergo a full recovery. However, glucosamine, chondroitin, and MSM have yielded excellent clinical results, particularly in the relief of osteoarthritis of the knee. They are best used as a trio as opposed to individually, too, in my opinion. Back pain is often a trickier condition to relieve due to variable causes, but knee ostearthritis has responded quite well to these supplements. Using the product as directed on the label or by a healthcare practitioner should yield results after a couple months or sooner. Some European trials examined results following 2-3 years of use and, as long-term results are the goal here, patience is required. You have to keep in mind that these supplements are not only intended to have a symptom-modifying effect, but also a structure-modifying effect. In other words, while pain is decreased and joint mobility is increased, cartilage repair is promoted - something not addressed in NSAIDs. You may want consult your father's healthcare practitioner who may be able to identify some potentially adverse drug interactions with any existing medications that your father is taking. Adults: Take two caplets daily with water or as directed by a health care practitioner. Not recommended for those on potassium-reduced diets, especially those with severe renal disease. Also, not recommended for those having adverse reactions to sulfate. Do not use if you have shellfish allergies, pregnant or breast-feeding. Consult a health care practitioner if you experience gastrointestinal pain, bowel movement disturbances or if you have diabetes. Discontinue use if allergic reaction occurs.